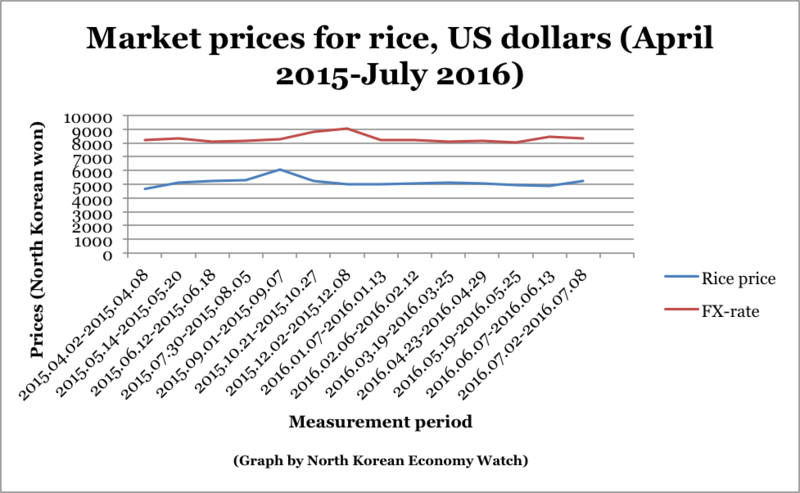 North Korean rice prices have dropped drastically one year after the sanctions. Why? 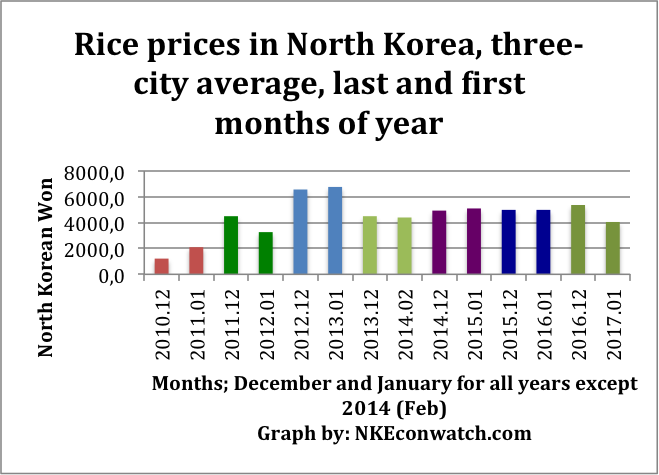 Prices for rice have fallen in North Korea. 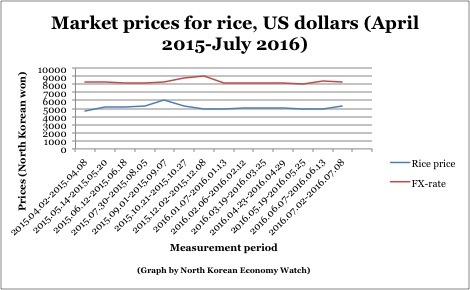 Daily NK, which tracks prices of rice and foreign currency in three North Korean cities, reported in the beginning of this week that rice prices have fallen thanks to continued development of the market economy and a steady flow of goods to and from China. This has happened despite expectations that the sanctions that the UN passed one year ago would cause inflation. In theory, the sanctions were supposed to curb trade with China because they targeted North Korea’s crucial minerals trade. In practice, a steady stream of news from the border suggests that trade has continued, albeit with periodic squeezes, following a familiar pattern of China’s sanctions implementation waxing and waning. This makes a lot of sense. A better functioning and more efficient market should logically lead to lower prices, as should increased trade with China, given the increase in supply. But neither of these two factors explains the timing. There are several other elements to take into consideration when analyzing price changes in North Korea. I am not making any certain claims here about the relatively drastic shift in prices, but rather, pointing to a few factors that may have contributed. First, one must ask: how big is the drop? The short answer is: pretty big, but not unprecedented. 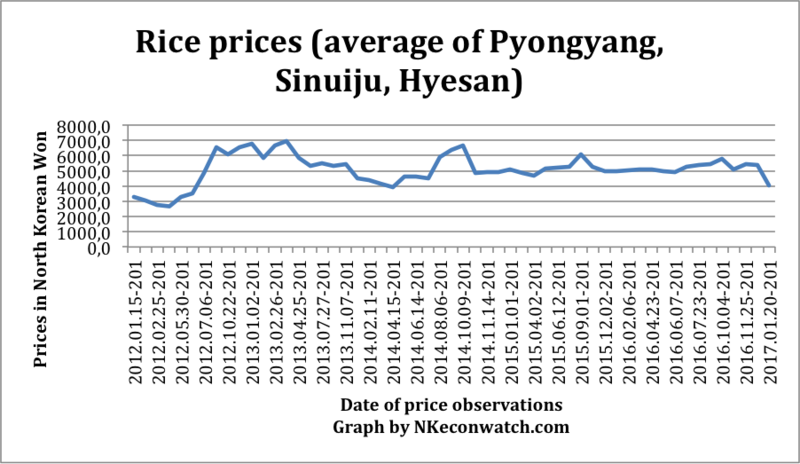 The following graph shows the last and first price observations in the Daily NK market prices database for every year since 2010–2011. (I’ve excluded 2009–2010 because of the distortions that the 2009 currency reform creates in the data.) It shows that a similar price drop happened between 2011 and 2012 as well. 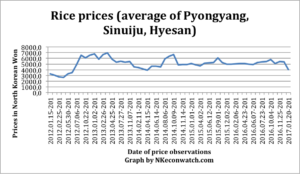 Graph 1: rice prices in North Korea, last and first year observations. Graph by NKeconwatch.com. Data from Daily NK. This latest price point, however, is not a historic low-point. We’ll see if prices continue to drop over the weeks, but as of now, there are fairly near time points when prices have been lower, such as April 2014 (see graph further down). Figure copied from World Food Program Food and Crop Assessment in the DPRK, November 2013, showing seasonal variations in government grain distribution. Rice prices, average of three cities, 2012–2017. Data from Daily NK, graph by NKEconwatch.com. Second, though it would be intuitively easy to conclude that the drop in prices was caused by better functioning market mechanisms and agricultural management changes, this doesn’t seem to be the whole story. Again, such changes are crucial and may well have played a large role in the greater price stability of the past few years. But they would not explain this sudden shift. Instead, the story seems to partially be the opposite, one of government action. A few days ago, Voice of America reported that PDS distributions in January of this year have, according to a World Food Program official, gone up by around ten percent as compared to the same period last year. 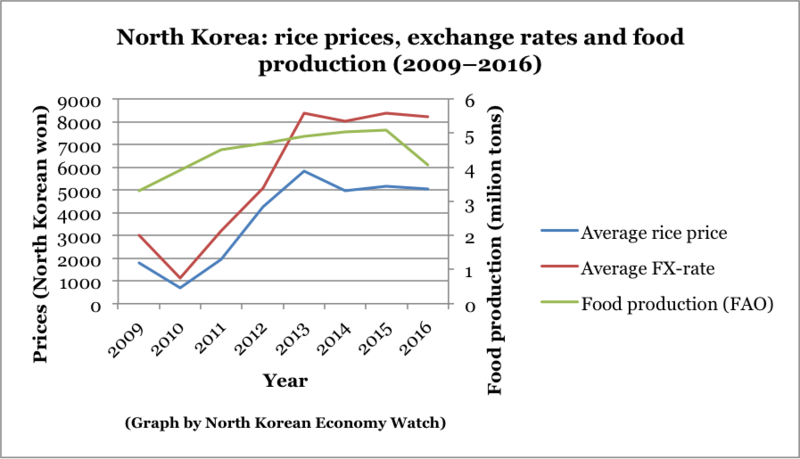 Both in September and November, the North Korean government imported significantly larger quantities of rice than usual. These imports presumably go out through state channels rather than the private markets. So while it’s impossible to isolate different effects from one another, it looks like the state can still have a significant impact on the food economy, even with the strong and continuously evolving market sector. This impact seems particularly likely this time around, given the sudden drop in prices. Only time will tell whether drop continues, or if prices continue to bounce within the limits of the past few years. North Korean hard currency shops providing foreign products for sale to the country’s wealthier citizens may soon see a full government takeover of its supply chains, leading to a drop in the quality and hike in the price of hard-to-obtain goods, North Korean sources say. The stores, which require payment in Chinese yuan or U.S. dollars, have operated in recent years in Pyongyang and other large cities under the management of private businessmen who pay large portions of their profits to the central government. Government-run trading firms are now poised to take over the purchase and pricing of products sold in the lucrative stores, though, a source in China’s Dandong city, just across the Yalu river from North Korea, told RFA’s Korean Service. Until now, shop managers have gone to China themselves to bring back products—including clothing, cosmetics, and furniture—or sale in their stores, RFA’s source said, speaking on condition of anonymity. “If this system of supply changes, not only will store managers be prevented from going to China, but no use will be made of their marketing and management skills,” the source said. Once the new system is implemented, stores will have to submit a list of needed products to their city’s local trading firm, which will then make the purchases from China itself, the source said. “There are doubts that [the government] will be able to supply needed products on time, though, and the change in quality and price of the items may lead to conflicts between store managers and the trading organizations handling product supply,” he said. Separately, a source in the capital Pyongyang said no official statement announcing the change has yet been made. “But there is a high possibility the new system will be established after the [ruling Korean Workers’ Party] convention in May,” he said. If put in place, the move may be aimed partly at further reducing the profits earned by store managers, who already pay most of what they earn to the government of the reclusive, U.N.-sanctioned state, the source in Pyongyang said. “North Korea’s foreign currency situation is urgent now,” the source said. “From now on, the managers of foreign-currency shops will receive only a small salary, as they did in the past,” he said. “Sales will drop, though, and the management will experience difficulties,” he said. Agricultural reforms in North Korea became a hot topic of discussion almost right away when Kim Jong-un took power in 2011. Only a number of months into his tenure, news began to come out of the country about attempts at agricultural reforms. It is unclear when (or even if) the June 28th Measures were finally extended to the whole country. At the very least, three years in, it seems beyond reasonable doubt that North Korean agriculture has undergone major changes. These have been aimed at boosting production by creating better incentives for farmers to produce and sell more of their output to the state rather than diverting it to the market. The most important aspects of these reforms are the decreased size of work teams and new rules that let farmers keep 30 percent of their production plus any surplus above production targets, while the state takes the remaining 70. These changes have been met with optimism among some. However, no one really knows exactly what impact these reforms have had. 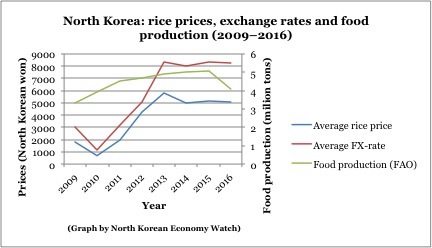 North Korean agriculture may be faring better than it used to – although this is also doubtful – but even so, it is too simplistic to assume that government reforms in agricultural management are doing all the work. As long as North Korea’s agriculture continues to be centrally planned by the state, there will be limits to how much better it can get no matter what reforms the state implements. To see why, consider some of the news that have been coming out of North Korea in the past few months, as reported by Daily NK. In late November, the online daily reported that in despite by multilateral aid organizations, North Korea had seen relatively good harvests this year. However, the increased harvests, according to people inside the country, were not caused by changes in the agricultural management system of state-operated collective farms. Rather, the North Koreans interviewed for the story claimed that private plot farmers had been better able to protect their crops from adverse weather impacts by using water pumps and other equipment. Even though trends like these alone probably have a limited impact, this shows that many circumstances other than state management matter. Although the regime has forced people to mobilize, the source asserted that farm yields are not increasing. So, then, “the best thing to do would be to further divide the land up among individuals,” he posited. Our source wondered if individual farms were not more successful because each person tending them personally grew and watered their plants. Currently, farmers must follow directives regarding the amount of water they can use on collective farms. He warned that if the system is not completely overhauled, crop yields will fail to improve. In other words: as is so often the case, management orders from above often do not align with the reality on the ground. One should be careful not to draw too many general conclusions based on individual interviews, but this is a well known general problem in all planned economies. Even with the best intentions, the state can never be fully informed about conditions and resources on the ground in an entire society. This is one of the many reasons why economic central planning falters. We have seen this, too, with Kim Jong-un’s forestry policies. The state gives orders that have unintended consequences on the ground, because information is lacking. No central planning team can be fully informed about the reality prevailing throughout the system. The information problem becomes particularly dire in authoritarian dictatorships like North Korea, where people at the lower end of hierarchies often have strong incentives not to speak up about implementation problems when orders come from the top. Ultimately, no matter what management reforms the North Korean regime implements, the country’s economic system remains the basic stumbling block. As long as central planning continues to be the ambition of economic and agricultural policies, there will be a limit to the success that agricultural policies can reach. We may expect to see agricultural reforms continuing, but as long as the system remains, they can hardly be revolutionary. Recently in Yanggang Province, as both Kimjang and the harvest season draw to a close, the price of vegetables and rice has gone down, and with winter right around the corner, fuel prices have begun to rise. An additional source in the same province corroborated this news. At the height of Kimjang season in mid-October, cabbage was trading at 1,950 KPW (0.23 USD) per 1 kg, but by the end of October it had dropped to 1,500 KPW (0.17 USD), and now it has dropped further still to reach 900 KPW (0.10 USD) per 1 kg. Rice has also dropped from 5,200 KPW (0.60 USD) to 4,700 KPW (0.55 USD) per kilogram. As North Korea moves to wrap up its fiscal year, residents who failed to complete their assigned tasks must make payments to fulfill their duty. Those without the money hand over part of the harvest from tending their personal plots to market sellers for cash and turn that in instead. The flood of harvested goods at the markets has thus driven down prices. Our source tells us that in mid-October, using Hyesan City as the standard, petrol was trading at 6,000 KPW (0.70 USD) per kilogram and diesel fuel at 4,000 KPW (0.47 USD) per kilogram. But since the beginning of November the prices increased to 7,000 KPW (0.81 USD) for petrol and 4,500 KPW (0.52 USD) per kilogram for diesel. In mid-November prices have increased to 7,300 KPW (0.85 USD) per kilogram for petrol and 5,250 KPW (0.61 USD) per kilogram for diesel. As the icy winter draws closer, hot foods are selling particularly well and the price of potato noodles, corn noodles, and others are more expensive compared to last year. Last year a small bowl of noodles was 1,000 KPW (0.12 USD) while a large bowl cost 6,000 KPW (0.70 USD); this year, small bowls of noodles are selling better than large bowls at a cost of 1,500 KPW (0.17 USD). 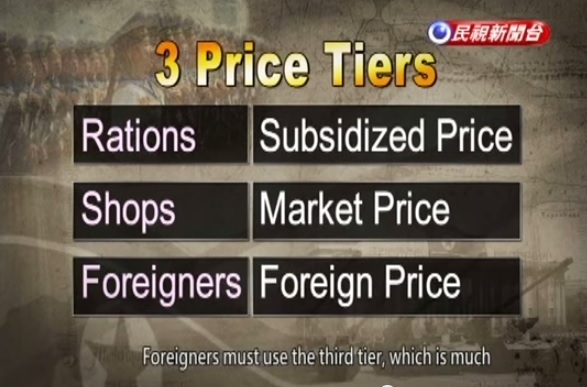 The North Korean authorities officially determine product prices in North Korea. However, according to inside sources, these prices are being ignored more and more in favor of prices determined by market forces. 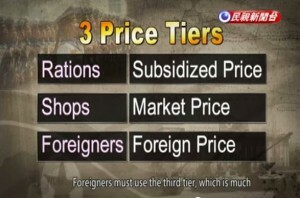 Instead of official price designations, the authorities have posted ‘price ceilings,’ but they are not strictly enforcing them. Daily NK spoke with a source in South Hamgyong Province who confirmed this to be the case there as well. “Furthermore, the price ceilings are being determined by the market rates, so the meaning of these regulations is fading. For example, if the going rate for rice at any given time is 5,000 KPW [0.58 USD] per kilogram, than the price ceiling would be set at something like 4,500- 5,000 KPW [0.52-0.58 USD],” she said. In a true indication that the national prices are being disregarded on a wide-scale level, even the authorities have shown signs that they are interested in understanding how market rates work. For example, from Provincial People’s Committees, cabinet ministers are being kept abreast of the local market rate for product prices on a daily basis. “They are trying to understand the exact market prices for given quantities of goods like electronics and foodstuffs,” the source explained. The market is a common topic for debate in history. How did it impact the rise of the anti-slavery movement in the US and the UK? What impact did economic conditions have in the French Revolution? These questions are, and should be, asked in the current debate about North Korea’s socioeconomic development as well. But despite the hope of many, the market might not simply be a story of growing individualism and disconnect from the power of the state. While such a trend may well be at work, it could also be the other way around. The most obvious conclusion is that the state is adapting itself to the bottom-up development of the market. Indeed, this is the way the story is often told. In this narrative, the government is only reacting to developments and has long lost the economic policy initiative. But one could also see a government that is confident enough to relax the rules. It just isn’t a certain fact that the state and the market are two opposing entities. First, connections to the state still seem to be good for those wanting to trade on the market. For example, according to the surveys conducted by Stephan Haggard and Marcus Noland that laid the foundation for Witness to Transformation (2011), party membership is still considered one of the best ways to get ahead in North Korea (or at least it was at the time when the surveys were conducted). A somewhat similar trend can be discerned in survey results presented by Byung-Yeon Kim of Seoul National University at a conference at Johns Hopkins SAIS in late September this year. Kim’s results also indicate that there is a strong positive correlation between party membership and participation in both the formal and informal economy. Second, the government is making money off of the market. DailyNK recently reported that the fees charged by state authorities for market stalls was raised. They also noted that regulations of the markets seemed to have gotten more detailed over the years. As noted in this report published by the U.S.-Korea Institute at SAIS, the space that the government allocates to markets has consistently increased in the past few years. Not only have official markets grown, many of them have also been renovated and given better building structures. All in all, this paints a picture of a government that controls markets while allowing them more space to function. It is not clear that formerly black market activity happening in the open means that the market is gaining ground at the expense of the state. They may well be moving together. That is good news for those hoping for stability, but bad news for those banking on a market-induced revolution. Despite the hope of many that the market will cause the demise of the regime, the role of the market force in North Korea’s history is far from clear. You are currently browsing the archives for the Price liberalization category.